Compass Group UK & Ireland are a FTSE 30 company, providing catering, food and support services in a huge range of locations from schools to hospitals, football stadiums to offshore oil rigs. Our goals were divided into two separate projects. First the successful launch of a SEO optimised new site with the goal of ranking for key service keywords. The second was a stand alone SEO project with a specific focus on helping to support recruitment of chefs and kitchen related roles. We successfully launched the website with all service keywords ranking in the top three positions in Google search results, which was a great success and created high quality enquiries leading to new contracts. 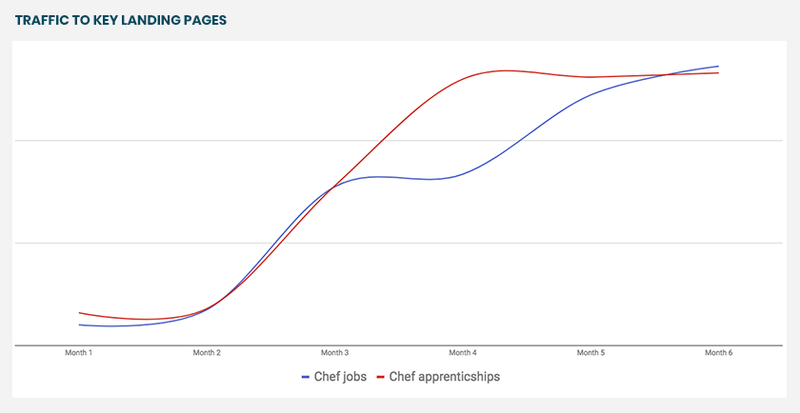 The second phase of the project also showed good returns, with some highly competitive keywords which the site has previously not ranked for, such as “chef jobs” and “chef apprenticeships”, being ranked on page one of Google search results. This in turn helped improve traffic to specific landing pages by over 76%. Our SEO process starts with identifying best ROI keywords based on competition, user intent and search volume. We then created the content required to have dedicated landing pages on the site, in the optimum structural position to benefit from internal linking structure, as well as optimising on-page meta and schema. We then created additional content to build external links from other group brands and external sites. We're always taking on new projects.